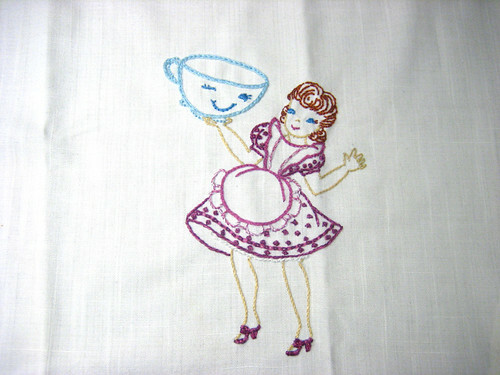 ~Glenda - your towel looks great! greenlightgo - yes you are the first of our group to get your towel back. I think it turned out great! greenlightgo you towel looks great! I love your towel greenlightgo. I have to take a picture of my completed towel. Things have been uber crazy. I will do it tomorrow for sure! things have been crazy here too... and I haven't had a chance to upload the photo... will do soon ...promise! greenlightgo, I love your towel!!! The mantis reminds me of the movie Kung Fu Panda (which is a good thing, because I love that movie ). I'm a llama! And I like it. I have also received my towel and need to take pictures! It's awesome and I love it so much! I dream of a house covered with your art, and would love a personal swap. Pm me if you'd like to spread the crafty love! I also need blue fabric scraps for a scrap quilt! 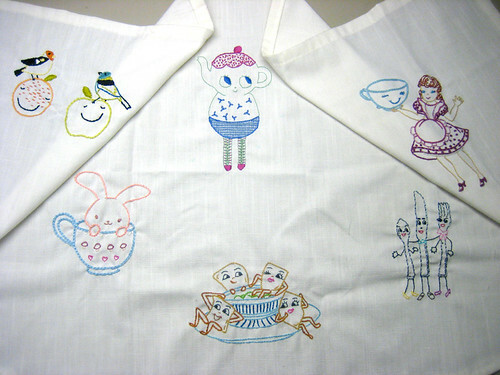 I got my apron back today and I looooooooooooooooove it!! 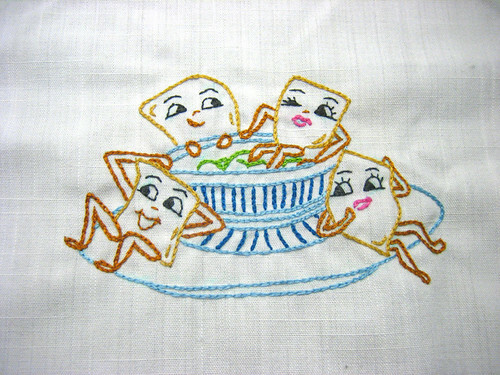 Thanks so much to everyone in my Sassy Swaggering Stitchers group! IamSusie, Kitten Wrangler, pearliepie, j_q_adams, and sarahj2001!!! 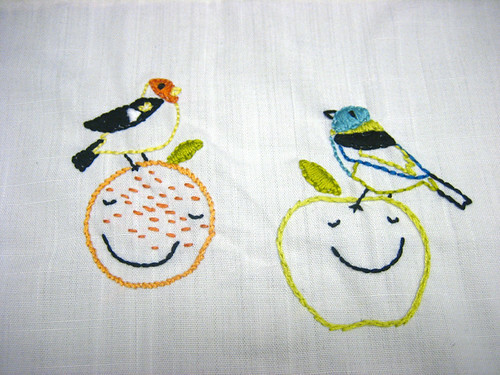 j_q_adams's cute birds and fruit! IamSusie's Flirty chips and guac! Thank you sooooo much everyone! You guys are all so amazing! 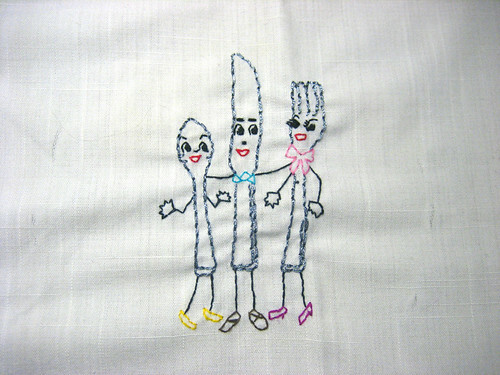 It was wonderful stitching with you this tour! 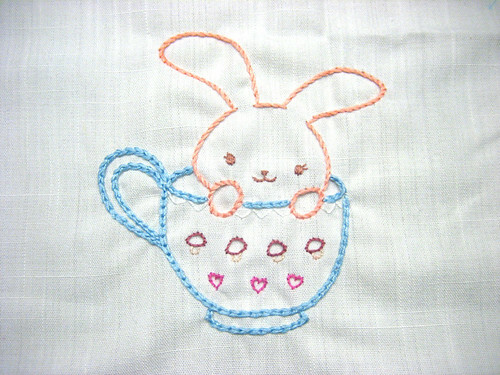 I can't wait to turn this into an apron! Maybe I'll wear it at Bazaar Bizarre next month when I meet Jenny Hart! ritapizza your towel is lovely! 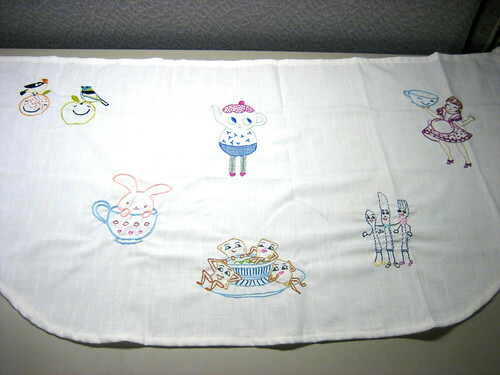 I've finished my stitching for sew~amy's towel. She had the VW/Camping theme. I went with a classic Beetle. 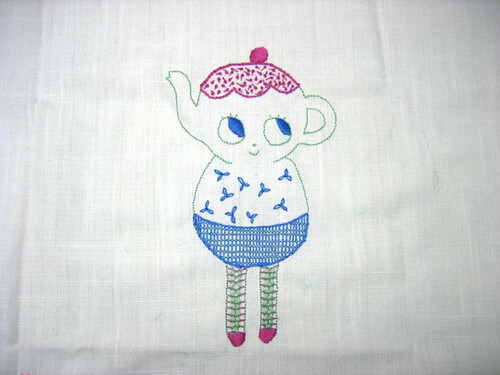 I'm the last to stitch on it so I'll let her show you the finished towel!! WOW! So many gorgeous towels! Going to Viva this year April 1-4!